There are thousands of children and infants need medical care for poisoning from Household Cleaning Products Poisoning. Although long term injury is rare, the anxiety and distress caused to both child and parents could be avoided by increased awareness. The group of children most at risk are the under fives and of these children aged one to three are at most risk. There are on average 15 children aged under 5 admitted to hospital daily in the UK due to sudden poisoning. Children from poor families are three times more likely to be admitted to hospital due to an accident, including accidental poisoning. 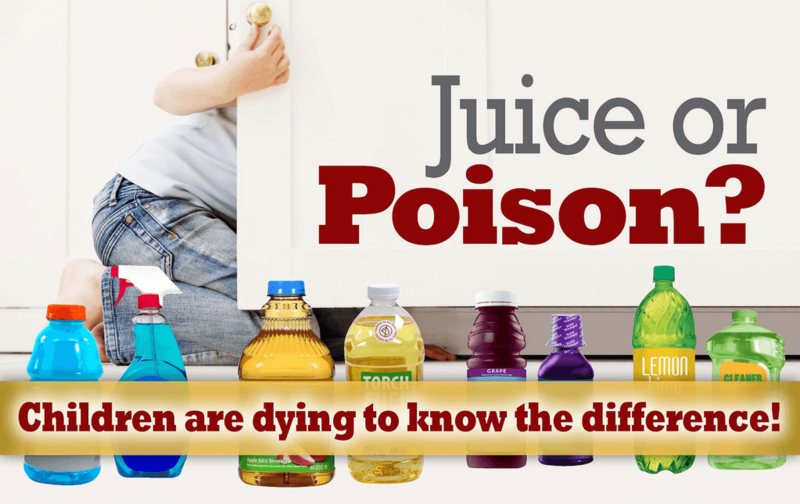 So why young children are more likely to be poisoned? Exploring is part of growing up but young children have little concept of potential dangers. They are inquisitive and will often put things in their mouth to further explore their texture and taste. Part of growing up is to watch and copy what other do, unfortunately this includes copying using potentially dangerous things like household products and medication. Also, small children may mistake liquid capsule style dishwasher and washing machine detergents for toys or sweets. These are not only a danger in relation to ingestion but can also cause serious irritation to the eyes which can result in long term damage. Residual chemicals on the skin should be rinsed away with copious amounts of water. Medical staff will need to take a detailed history to effectively treat a person who has been poisoned. Give details of any symptoms that the person has had, such as whether they have been sick. How can accidents with household cleaning products be prevented? Mixing household products can cause dangerous gases to form. What else can you do as a parent? Well, Teesside First Aid offer a variety of courses for teaching first aid about children and babies. We have our Paediatric First Aid course (that meets Ofsted requirements), we have our Grand/Parent First Aid course or our Paediatric First Aid for Nannies and Au Pairs to choose from. Whilst we are on the subject of First Aid and children did you know that ProTrainings EU can offer FREE, yess FREE, first aid courses for school children? Teachers are provided an online dashboard to monitor the students’ progress. They can also view completion and test scores and even order cards all from a single online dashboard. We agree that these organisations are on to something. Interviews with emergency medical professionals indicate that children are sometimes the most proactive and effective lay first aiders. In a recent news article, 9-year-old Tristan saved his sister’s life after she fell into a pool and was pulled out not breathing. He snapped into action and revived her using CPR he learned from a movie on television. By offering a free first aid programme for schools, ProTrainings have made this goal a reality. Secondary school students are prime candidates for performing CPR because they still have the general boldness of young children while being strong enough to perform compressions. Studies have shown that 83% of secondary-schoolers are very willing to provide bystander CPR. 86% of these students support mandatory CPR training in secondary school.